Hatamoto (旗本) were “men of the banners”, or simply “bannermen”. In the beginning, the word referred to a shogun‘s military camp. Later, it was used for the men who were guarding the camp, a position to which the Tokugawa shogun appointed low-ranking vassals who had fought on Tokugawa Ieyasu’s side in the Battle of Sekigahara (1600), and their descendants. Thus, the hatamoto became direct vassals of the shogun, receiving an annual rice stipend of 100 to 10,000 koku (石, one koku being the equivalent of 278.3 litres or 150 kilograms/330 pounds), a higher rank than the gokenin (御家人), who usually received under 100, but never more than 200 koku. The hatamoto fulfilled various military and civil functions within the bakufu, in Edo or the provinces. They were divided into three classes: kōdaiyoriai, yoriai and kofushin. All of them had the right to a direct audience with the shogun. There were about 5,000 hatamoto in the 18th century, and they were always firm supporters of the bakufu and valued for their abilities in the positions they filled. These positions were passed on to their heirs, or to their younger brothers or adoptive sons. However, by the 18th century, the hatamoto began to be impoverished and forced to sell their kokudaka to wealthy merchants in return for money and to spend vast amounts of financial means to sustain their rank. Gokenin were direct vassals of a shogun, too. In the Kamakura Period, it was the term for about 2,000 samurai families, who became hereditary vassals of Minamoto no Yoritomo and received land or became jitō (地頭, land stewards) or shugo (守護, governors). 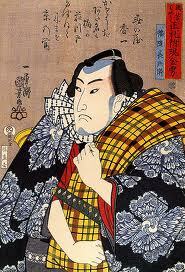 The gokenin served as the shogun‘s guard and constituted the basis of his army. In the Muromachi Period, the gokenin were divided into two classes: those under the direct control of the shogun (奉公衆 hōkōshū), and those under a shugo (地頭御家人, jitōgokenin). During the Edo Period, the gokenin were the shogun‘s lowest-ranking direct vassals, below the hatamoto, and did not have the privilege of being received by the shogun. Due to their low stipend, many of them were impoverished. Many hatamoto, who were hopelessly indebted, yet unwilling to resort to manual labour or business, became teachers of martial arts or even criminals. During the Meiji Restoration, a great number of hatamoto received salaries from the government. Despite those subsidies, their situation aggravated and they – forced by circumstances – melted into the general populace to earn their living by other means. Also known as kabukimono (傾奇者); in the early 17th century, many hatamoto were forced into idleness owing to the relative peace established by Tokugawa Ieyasu. Due to their inability to prove their valour, they acted obnoxiously and scandalously with other hatamoto or the general public, often provoking disturbances by becoming violent with the machi yakko, their urban counterparts among the chōnin. The shogunate reacted promptly by arresting some of these unruly characters, which cooled the ardour of the others. Kabuki theatre and literature seized on the as kabukimono or stock characters, whom they invariably portrayed as quarrelsome, unstable, antisocial people wearing flamboyant garment. Machi Yakko (町奴) on the other hand, referred to delinquent boys, who controlled the labour market for commoners in big cities. They were sometimes employed by the shogunate as an auxiliary police force. According to some scholars, both hatamoto yakko and machi yakko are the origins of the modern-day yakuza.